The 4 Most Important Things You Need To Know. Looking for the best acupuncturist in Overland Park, KS may be a daunting experience for some people, but it doesn’t have to be if you know what to look for. The best way to find a good acupuncturist is to ask your friends and family for the name of a practitioner they’ve had a good experience with. But if that’s not possible here are 4 important points to remember when interviewing an acupuncturist for the first time. 3. Do they work full-time? 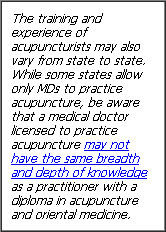 Look for an acupuncturist who practices full-time with flexible hours. This helps getting in to see them sooner than later. 4. Do they have more than one treatment room? An acupuncturist operating 2 or 3 treatment rooms instead of 1 has, increased capacity and the flexibility to get you in on short notice. When you are in pain or have to get that much needed treatment, this alone can make the difference between getting in today or getting in next week.